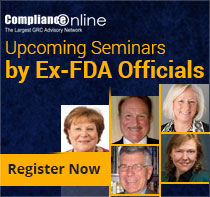 ComplianceOnline, the leading GRC advisory network with over 1500 experts has announced its upcoming seminars for professionals working in FDA regulated industries across the United States, Europe, Asia, and Australia. Get the comprehensive list of upcoming seminars by ex-FDA officials. As manufacturing gets increasingly complex with introduction of new technologies and operating procedures, the regulations have become labyrinthine in their scope as well. Companies now not only have to worry about plants they own, but contract manufacturers, foreign facilities and the headache of ensuring that suppliers/vendors are compliant with regulations. The incremental increase in FDA Form 483s and warning letters show that the agency is becoming increasingly stringent in its inspections of facilities and operations. Navigating the Maze for Post-Market Compliance -- Complaint Handling, MDRs, Recalls, etc. “Speaker was very knowledgeable. Glimpses "behind the curtain" in to the FDA are quite valuable in my opinion. ComplianceOnline has a broad catalog of professional advancement opportunities,” Manager, Quality Control at Quanterix Corporation. “The instructor was outstanding and shared great examples which really clarified the application of course material,” Sr. VP Operations at Hologic Gen-Probe. ComplianceOnline will be adding more live in-person seminars to its schedule for 2017, aimed at further cementing its position as the top providers of compliance training for FDA regulated companies. For more information on the 2017 seminars by ComplianceOnline please click here.